The Marrara detention basin is currently being constructed on the corner of McMillans Road and Henry Wrigley Drive in Marrara to temporarily detain storm water flows from Anula, Moil and parts of Marrara. Construction of the detention basin, combined with other flood mitigation measures, will reduce the impact of flooding on downstream properties. Construction commenced in mid- June 2018 with the aim to complete the bulk of the earthworks before the onset of the 2018 wet season. 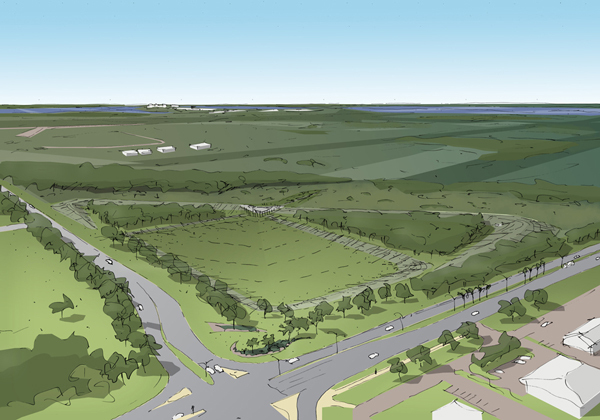 Whilst most earthworks have been completed, the construction of the embankment is now expected to be completed early 2019 due to the management of asbestos containing material found on-site. The Department of Infrastructure, Planning and Logistics is working with the Northern Territory Environment Protection authority and an independent auditor to manage the temporary stockpiling and safe containment of asbestos. As a result, a small area of vegetation will need to be cleared in the south east corner of the basin. To minimise the impact of heavy rains on the construction site, additional erosion and sediment controls have been put in place. When complete, the basin floor and embankment will be grassed and it will remain free draining, detaining water generally no longer than 24 hours after a large rainfall event. Residents and the general public will be kept updated throughout construction with respect to any impacts and required traffic management on Henry Wrigley Drive as part of the project.